Seasons: Spring, summer, and fall. Highway 20 closes for the winter in mid-November. Forest Passes: Pacific Northwest Forest Pass (for certain hikes); national parks and forests free on Sept. 24 for National Public Lands Day! Plan your trip on My Scenic Drives! Editor's note: This road trip was first published on My Scenic Drives, where you can find a more detailed itinerary, and tools to create a custom road trip, as well as numerous other road trip ideas. Find the My Scenic Drives backstory here. The North Cascades Highway is the first National Scenic Highway in the United States. 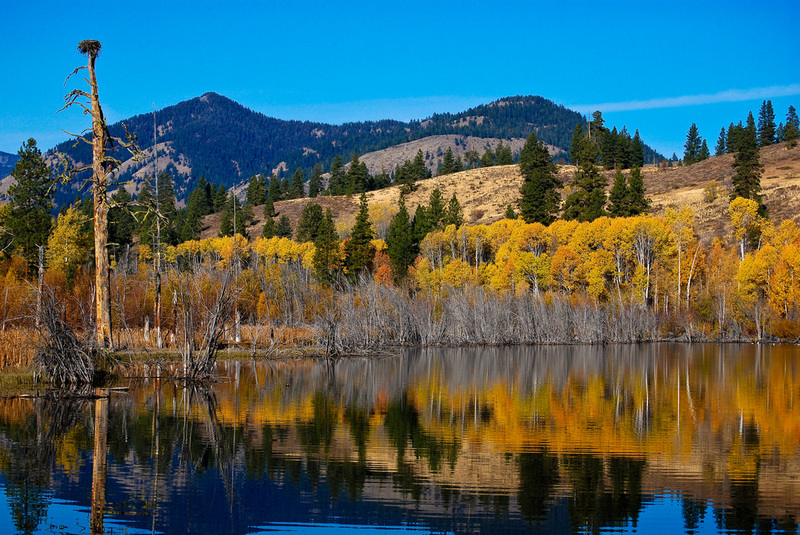 Prepare for sweeping vistas, alpine meadows, wildlife-watching opportunities and recreation galore. Where to start: This mountain scenic drive begins in Sedro Woolley. To get to Sedro Woolley, take Exit 230 off of I-5 and follow WA-20 East, or head north on WA-9. Note that the North Cascades Highway is closed from mid-November to April. Check road conditions before heading out near these dates. Skagit River: The drive travels alongside the Skagit River, passing many farms offering seasonal bounty of apples, berries, pumpkins and honey, with some featuring U-pick experiences. Don’t miss a chance to stock up on fresh, local picnic goodies. Concrete: In 24 miles, you approach the town of Concrete. Giant concrete silos stating “Welcome to Concrete” will greet you. There is a small parking area if you want to take photos of the iconic signage. From Concrete, you can reach Shannon Lake and Baker Lake by following Baker River Road and Baker Lake Road to enjoy fishing, boating and water-skiing (in the summer). Eagles: As you continue east on WA-20 from Concrete, look out for eagles during winter, as this location is home to the second largest eagle gathering in the United States, the first being Alaska. Learn more about this majestic bird and its habitat during the Skagit Eagle Festival, held the entire month of January with activities in Concrete, Rockport and Marblemount. The Skagit River Bald Eagle Interpretive Center, located at Howard Miller Steelhead Park, features eagle presentations, viewing stations and boat tours. Howard Miller Steelhead Park offers year-round tent and RV camping, fishing, rafting and hiking trails. Follow map link for an expanded map. Rockport State Park: Rockport State Park is a beautiful, old-growth forest that has never been logged. This creates a dense canopy where minimal sunlight reaches the ground and the original ecosystem still remains. Trails explore the forest and offer a chance to observe birds and wildlife. Sauk Mountain: A 4.2-mile roundtrip to the summit of Sauk Mountain rewards with incredible views. The trailhead is just past Rockport State park along the gravel Sauk Mountain Road (FS 1030). Note all Washington State Parks require a day-use fee or use your Discover Pass. Highway 20 to Marblemount: At Rockport, the WA-530 joins the WA-20. Our drive continues east on the WA-20. If you were to continue on WA-530 towards Darrington, you would access the Mountain Loop Highway. As you approach Marblemount, you should note that there are very few gas stations for the next 90 miles, making this a good time to check your gas tank. Ross Lake National Recreation Area: Six miles east of Marblemount is the Ross Lake National Recreation Area. This area includes Ross Lake, Gorge Lake and Diablo Lake. Views of glacier-topped jagged peaks, waterfalls, rivers and lush forest are breathtaking. You will definitely want to take advantage of the many turn outs for photos. Newhalem: In nine miles you arrive in Newhalem. Stop at the North Cascades Visitor Center to learn more about the area through exhibits and video presentation. From here, there are a few trails, including a recommended 200-foot paved trail to an overlook of the Picket Range, a range contained entirely within the North Cascades National Park, and a one-mile hike to examine the Skagit River up close. Note the visitor center is closed from November to spring. Check the National Forest Service website for road conditions and dates. Gorge Creek: Just past the Gorge Dam, stop at the Gorge Creek Falls, which cascade into Gorge Lake. There is a parking area and pedestrian walkway to the overlook. 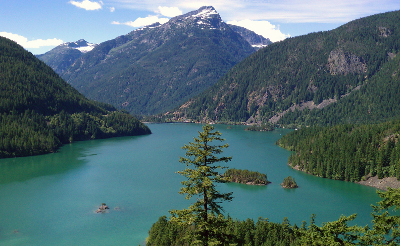 Diablo Lake: Moments after this, you will see Diablo and Diablo Lake, popular with swimmers and boaters. Just after the bridge, the Lake Diablo Overlook is a must stop for incomparable views of the surrounding Cascades, Pickets, Diablo Lake, and more. The incredible emerald-green color is caused by the sun's reflection on glacier-ground rock dust suspended in the water. There are many hiking opportunities for all levels. Just after the Overlook, the Happy Creek Forest Walk is an accessible boardwalk that features informative interpretive panels about the forest. 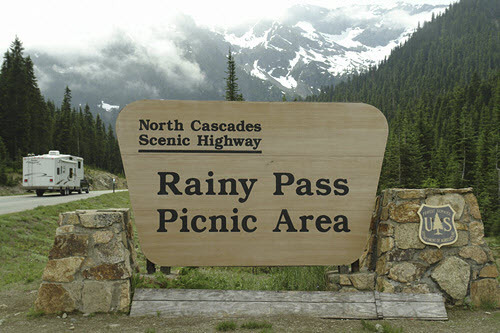 Rainy Pass picnic area: Twenty-four miles from here is the Rainy Pass Picnic Area, located within the Okanogan National Forest. Take the one-mile, accessible paved trail to Rainy Lake (W4) to examine local flora and waterfall. Up for more of a challenge? Hike the 7.2 mile Maple Loop Trail (less steep counterclockwise) for outstanding views. Fall delights when golden larches and crimson huckleberry bushes blaze across the mountains. A day use fee is required to park/hike here covered by an America the Beautiful or Northwest Forest Pass (note: national parks and forests free on Sept. 24, National Public Lands Day!). In six miles, Washington Pass is the highest elevation of the drive at 5,477 feet; you will be surrounded by the peaks of the Cascades. Amazingly, this pass once was at the bottom of the Pacific ocean! The drive descends steeper than the previous sections and after a hairpin turn, you will be back in a valley of farmland. 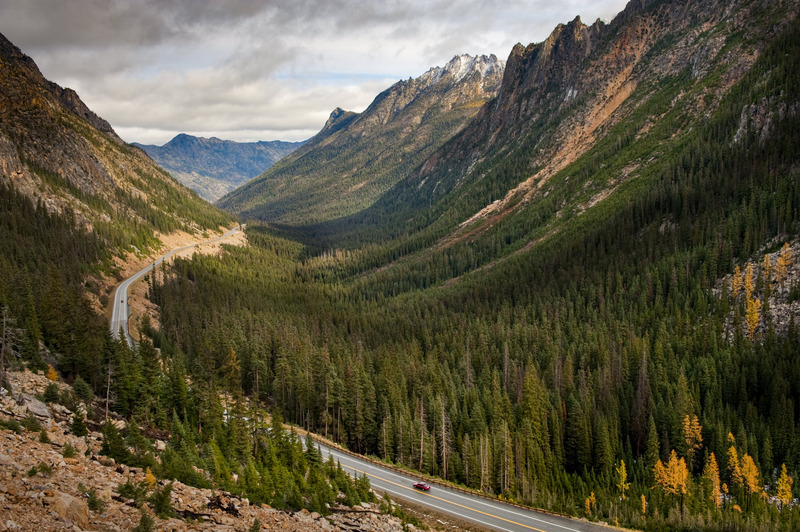 Mazama: In Mazama, consider a great side trip to Harts Pass, the highest driving point in the state of Washington. To get there, turn onto Lost River Road and turn left onto Goat Creek Road. Drive up Goat Creek Road, turn right onto Lost River Road, and join onto Forest Road 5400 until the end. The nearby Slate Peak has incredible panoramic views of the surrounding areas. Winthrop: Our drive continues on WA-20 to Winthrop, known for the whimsical American Old West design of the town buildings. You’ll note that the climate here is remarkably drier and hotter than the first section of the drive. 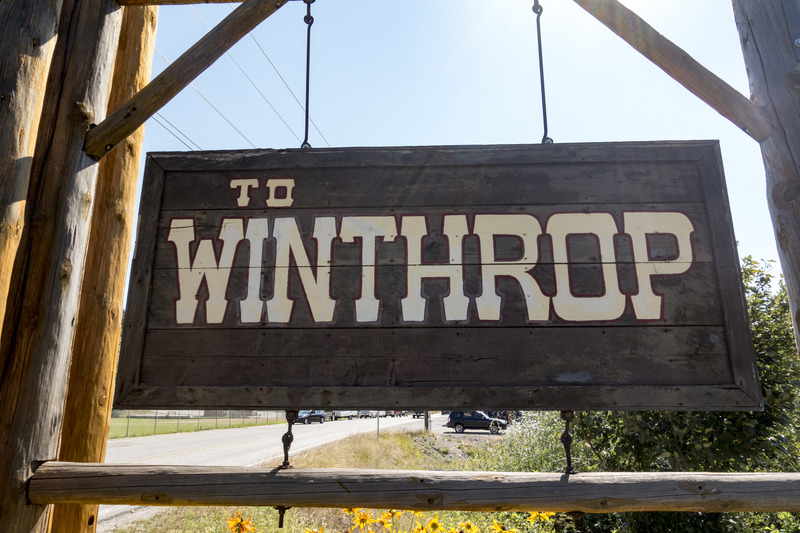 Winthrop is a hub for year-round recreation including horseback-riding, kayaking, rafting, fly-fishing and in winter, prime cross-country skiing. You’ll find ample dining and lodging options, as well as great shopping, making this a perfect weekend destination. 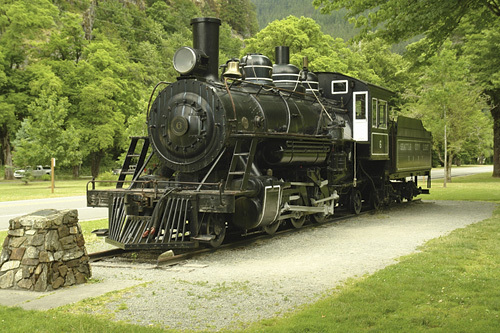 Visit the Shafer Museum to learn about the Cascade Valley’s pioneer and mining history. The museum comprises six original buildings from the 1800’s such as the print shop, the castle and general store. Admission is by donation. Check the website as hours are limited. Loop: From Winthrop, you can continue the Cascade Loop by going to Wenatchee. The loop would continue to Stevens Pass Greenway and Whidbey Island. 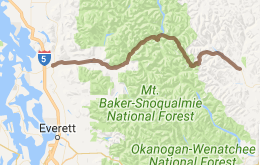 If you are driving the drive in the opposite direction, WA-9 can lead you to either Mount Baker Highway by heading north or Mountain Loop Highway by heading south. Or for a ferry ride, continue to Horseshoe Highway on Orcas Island or Whidbey Island. My Scenic Drives is a free road trip planner and scenic drive finder, perfect for day trips, weekend getaways and cross-country adventures. My Scenic Drives combines two essential aspects of road-tripping — pre-planned scenic routes highlighting captivating places of interest with a feature-rich road-trip planner.